Dans le cadre de l'établissement de ma liste de cadeaux (oui, j'suis un peu - beaucoup - psychorigide, j'aime bien avoir des trucs qui me plaisent à Noël... oui, magie, blabla, surprise... bon), je m'adresse à monsieur Kian pour avoir son avis sur "Captain Harlock - the endless odyssey"! Merci beaucoup pour ces informations. Je viens de lire la critique de dvdanime et l'aspect sombre qui en ressort me semble assez séduisant. Visiblement, il semblerait que le traitement soit plutôt psychologique, ce qui devrait me plaire. Vais me contenter de copier/coller. Leiji Encyclopedia nous annonce la publication dans l'edition du 14 mars du quotidien Mainichi Shimbun de l'illustration d'une tour de 1008 m dont la construction est prevue a Toshimaen et qui a ete designee par Leiji himself. enjoy! The design is planned to Reiji Matsumoto and Toshimaen. Reiji Matsumoto who talks about desire to new tower(taking a picture: Tuuocona Yoshikawa)【 Livedoor news March 13】? "Tokyo world tower promotion conference" (remote mountain Socotoco chairman) that promoted attracting the plan Kei tower (tentative name) as a sending base of the ground digital broadcasting announced the outline of 1000-meter class tower planned in "Toshimaen" of the amusement park in Nerima Ward, Tokyo on the 13th. The height of the tower is 1008 meters. It is more almost twice as much compared with 533 meters of the CN tower in Canada in which it boasts of the best height in the world at present. It is a schedule of the view room the installation in the height of 350 meters on the ground and 650 meters, and the site plans the tower and local facilities among about 300,000 square meters of Toshimaen on the site and 20,000 square meters are planned additionally. Moreover, it was clarified to have requested cooperation to Lotte of the cake major company (The headquarters: Shinjuku Ward, Tokyo and president Takeo of Shigemitsu) as an enterprising body. This conference is civilian organizations that center on "Meeting on the 8th in Nerima" in which the commerce and industry association, the physical education, welfare in Nerima Ward, and the chairman and the sub-chairman of a cultural related group participate. "Meeting on the 8th in Nerima" originates in 8 meters among the height of the tower. The cooperation of the design of the tower etc. ..Special Counsel.. is received inviting cartoonist and Reiji Matsumoto of the same district living. In the interview held in Hotel Metropolitan in Toshima Ward, Tokyo, the Yamada loyalty sub-chairman of this conference talked about eagerness , saying that "Aim at the eco-tower where not only the best height in the world but also the environment had been considered". "New tower promotion of six living in Tokyo companies project" that composes of NHK and five living in Tokyo commercial broadcast television games in March, 2005 selects "District around Gyouhirahashieki of Oshiage" about the planned construction site in a new tower and Saitama New Urban Center is selected to the second candidate site in the first candidate site. Moreover, the Japanese electric wave tower where Tokyo Tower where the electric wave of digital broadcasting on the present place is transmitted is managed also proposes the plan to repair the total height of the tower from 333 meters to 360 meters to the broadcaster. At first, the end of December in '05 is postponed at the end of March due to the insufficiency at the conference time though scheduled the construction ground to be decided to the object. Ils sont fous ces nippons! Leiji Encyclopedia nous inforne que l'aeroport de Northern Kyushu va embaucher un robot Maetel en guise de guide pour les passagers. Masako Ikeda lui prete sa voix. Chouette, on pourra lui demander ou est la porte d'embarquement pour le triple 9! Galaxy Railway nous informe que des images de l'attraction GE999 de l'hotel "Epson Shinagawa Aquastadium" ainsi que des produits derives sont visibles sur le site de la Toei. Cliquez sur le controleur pour lancer la video de l'attraction! A venir lors du Tokyo international animated cartoon fair au printemps 2006: une collection de timbres Yamato, ainsi que des cellulos en version inédite (leur rendu serait différent de l'anime original). Vous vous souvenez des Orions? :D Galaxy Railway nous informe qu'une nouvelle version des billets a été mise en circulation à Kyushu du 1er avril 2006 au 16 mars 2007. It circulates in the Northern Kyushu City Oo district (Yahatanishi Ward) according to the note change to ..conductor of "Regional currency orion".. version. (One in April, 2006?March 16, 2007)However, Hageme is waited for. Everyone seems to be able to assume 100 orions to be 100 yen, to issue only one kind of 100 orions, and to buy 1000 orions for 950 yen. Cartoonist and Reiji Matsumoto of the Northern Kyushu City coming from agreed to the outline of the regional currency orion and the picture of "Milky Way railway 999" was offered. It is written, "Earth →(by way of orion Pleiades)→ andromeda" in the getting on passing of "999" that the hero and Tets of "Milky Way railway 999" got from Matel. It aims going also of this regional currency orion to "It is passed (The regional currency orion is used)→ future (Everyone is a livable community) as for → orion of present". Please confirm detailed information and information on the purchase place concerning "Regional currency orion" on each homepage of Northern Kyushu City or a regional currency orion official site. Leiji Encyclopedia nous apprend qu'a l'occasion de la 40eme edition du rallye sportif d'Oma qui aura lieu le 29 avril, une illustration specialement realisee par Leiji ornera la couverture des programmes vendus 1000 Y. Elle sera distribuee gratuitement sous forme de poster aux 30 premiers arrivants. - The child who runs to the dream is expressed in Milky Way railway 999. The poster of Mikio the 40th time Ota commemorative international track and field sports rally (Hiroshima land association, television new Hiroshima, and Chugoku Shinbun Publishing sponsoring) that was the Hiroshima Big arch of Hiroshima City Asaminami Ward was completed on the 29th. 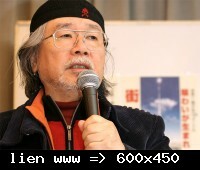 Reiji Matsumoto (68) of cartoonist used the character of most important work "Milky Way railway 999", and the image of the rally was expressed. The illustration that decorates the cover of the program depicts the appearance where children run out cheerfully under a gentle look of the heroine and Matel of "Milky Way?". Mr./Ms. Matsumoto overlapped the desire that the late Mr. Orita had put in the rally , saying that "A lot of children are the hope of the own challenge in adult gentleness and the encouragement aiming at the future". L'auteur est un astrophysicien repute au Japon. Paru pour la premiere fois en 1950, l'ouvrage reste une reference pour apprendre les bases de l'astronomie. Comme d'autres mangaka, Leiji aurait connu ce livre a l'ecole primaire et il l'aurait notamment inspire pour GE999. Classics of child science book on 1950 beginning of the year printing. 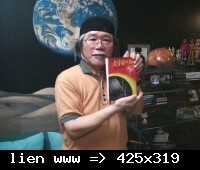 The author is one of the originators of the astrophysics research of Japan. It is a content in the story of the adventure fantasy tailoring including difficult expertise from the base of astronomy. A detailed explanation of the latest astronomy by Osaka Kyoiku University and a Fukue pure professor is added in best-selling and the original this time and it reprints. One the best for still learning of base of astronomy now. Cartoonist and Reiji Matsumoto are enchanted to the world in this book at the sixth grade of elementary school, and say that it makes this a starting point and invented a lot of masterpieces including 'Milky Way railway 999'. In his work, this books are all starting points. The impression sentence is here. 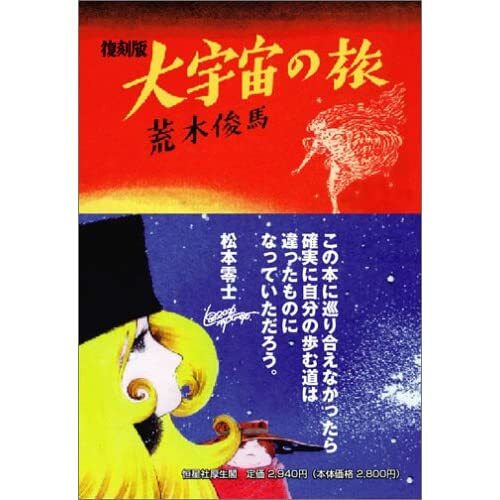 Moreover, it is a starting point of the Matsumoto work that holds a fan deep-rooted as Reiji Matsumoto of the cartoonist known by 'Milky Way railway 999' and 'Space battleship Yamato' says, "All my works did not arise if this book was not read". 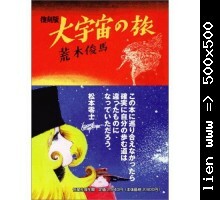 The composition of the story that a beautiful woman invites the boy to Space Odyssey runs with the Matsumoto work. There are a lot of parts of a basic content that are more excellent without becoming antiquated than that of a present general manual. To read as the illustration is also abundant, and an astronomical beginner is happy, it is devised. It is comprehensible from feature → base of this book to a special content, and is interesting. - The narrative style like the adventure fantasy that the way of talking is not in the current child science book. - A real content that the present astronomer also marvels though it is child writing must be included. - The illustration must be composed a lot, and legibly. A special content must be an explanation that is easier because of the insertion of figure. C'est impresionnant, Matusmoto est partout ! Tu l'as pas déja ce coffret ? T'as misé sur combien de participants ? En fait je suis tenté de l'acheter, mais entre les critiques pourries d'un côté et les pas critiques "ca depend des gens" de l'autre, je suis plutôt indécis au final. Page générée en 0.34 secondes avec 46 requêtes.